A massive American pro-water-drinking program launches today. It makes odd claims. Obama's appearance today is just part of the campaign's “bi-lingual day of water messages on a dozen TV shows … which will involve hosts drinking water and encouraging viewers to drink water." The shows include Today, Good Morning America, The View, Live With Kelly and Michael, Late Night, The Tonight Show, The Late Show, The Doctors, and Rachael Ray. All will feature “Drink up” messages. “40 percent of Americans drink less than half of the recommended amount of water daily,” said Sam Kass, White House senior policy advisor for nutrition policy [sic? ], yesterday. Kass and Mrs. Obama’s press secretary Hannah August attributed that statistic to a CDC study. The problem is, though, that there is no recommended daily amount of water. If we knew how much we should be drinking, and it turned out we weren’t drinking enough, then yes, tell us to drink more. If they were telling us to replace soda in our diets with water, that would also be reasonable and potentially productive. They're explicitly not doing that, though. Here is that "adequate intake" recommendation from the Institute of Medicine. The Mayo Clinic's recommendation is "If you drink enough fluid so that you rarely feel thirsty and produce 1.5 liters (6.3 cups) or more of colorless or light yellow urine a day, your fluid intake is probably adequate." Not that you have to measure your urine every day, but you get it. 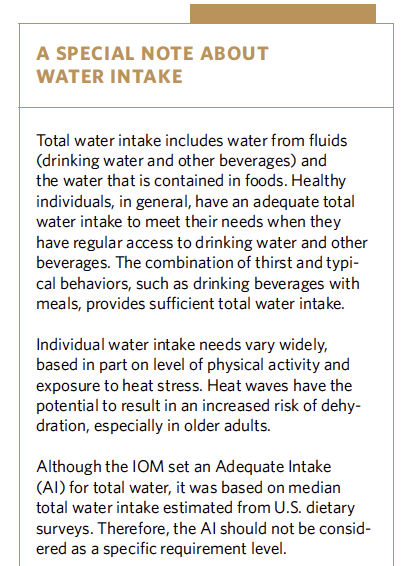 The Institute of Medicine likewise sidesteps quantified intake guidelines and takes an Al Jones-esque approach: "Let thirst be your guide." That’s what most doctors will tell you, too. 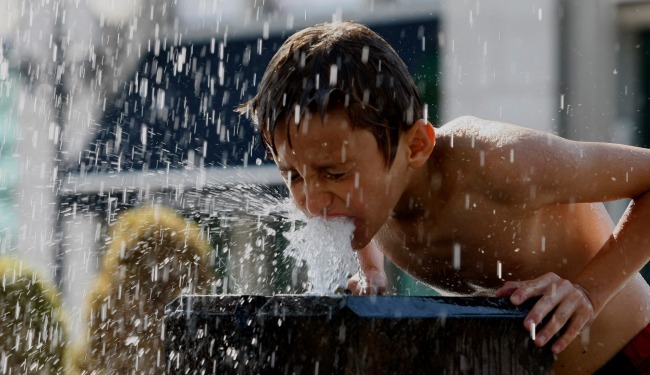 What could be simpler and actionable-r than a call to drink more water? Mrs. Obama, we love you. We also love kids and believe they should be healthy. But let’s actually not move on this for a minute, because it’s missing all the points. Sam Kass joined the White House via the kitchen staff in 2009, when he took job as Assistant Chef. He is now Senior Policy Advisor for Nutrition Policy [again, possibly sic; seems redundant]. He is also Executive Director of “Let’s Move!” Kass briefed members of the press yesterday, including me, about the launch of Drink Up. As August put it, “This new effort will remind people that more water helps you have more energy and stamina so you can do more, longer and with better focus.” I’d love that to be true. Plus, PLUS, the average United States person is already drinking 38 percent more water than 15 years ago. It is true that a quarter of kids are drinking no water at all, that doesn't make it prudent to tell everyone to drink more. Too much water can be as bad as too little. One of my colleagues asked the question that was on my tongue: What are the health benefits you refer to? Kass replied, "I think the science and evidence about hydration abounds. Starting with headaches, it leads to many more conditions. But this isn't a public health campaign. We think that being positive is most important, not getting into all the details about what a glass of water can do for you, is the message." To be fair, Kass is a chef, not a scientist, and that was off the cuff. But if you’re a national policy advisor on nutrition, and launching a campaign whose singular objective is to tell 314 million people to drink more water, your cuff should have some data that says more water is better. Kass: "We think a positive, forward-leaning campaign is the most effective way to insure that people are getting the water they need. Water is the simplest, most accessible healthy choice people can make, We're going to keep it positive from start to finish." Lawrence Soler, president and CEO of Partnership for a Healthier America, fielded that one. “It's less a public health campaign than a campaign to encourage drinking more water. To that end, we're being completely positive. Only encouraging people to drink water; not being negative about other drinks. " This is a public health campaign. How could this be anything but a public health campaign? How is this not a public health campaign? What is it? “[Today’s] launch in Watertown will involve having fun. It will emphasize emotional appeal, like a product launch more than a public health campaign,” Kass said. No, I still don’t get it. Just, don’t think about it. Repeat the slogan you’re going to hear: "When you drink water, you Drink Up." "When you drink water, you Drink Up." "When you drink water, you Drink Up!" That includes American Beverage Association, Aquafina, Arrowhead, Beverly Hills 90H20 (no joke), Britta, Dasani, Evian, Global Tap, Ice Mountain, International Bottled Water Association, Nestle Purelife, Poland Springs, Smart Tap, Swell, Voss, and Zephyr Hills. Is that, I mean I don’t want to accuse anyone of anything, but is that relevant? I’m still not sure why Chicago would be telling me to drink more water. Or if I should. So I inquired further with the First Lady’s press office. Me: Hi, one follow-up question from today's call. Do you know where the CDC daily water intake recommendations (mentioned in the call) are available? August: Here are two relevant sources. (This is the one that says 43 percent of Americans drink less than four cups of water a day, including 7 percent who don’t drink any water daily.) 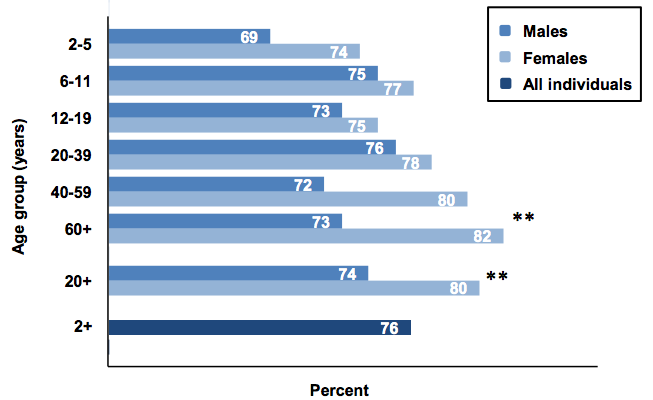 And here’s an attachment, which says that a quarter of American children aren’t drinking any water on any, given day. August: For your background, the new campaign isn’t going to go into how many glasses, ounces, etc. people should drink every day. The campaign and the First Lady will be asking people to just drink more water – starting with just one more glass a day. Kass said, "She is a water drinker from morning until night." Between the lines of statements like that, I hope what's really meant by "Drink up!" is this: Replace soda with water, yes. Remember that too much water can still be bad, though, and for most people we have no reason to believe that an extra glass of water will result in health benefits. Drinking a glass of water certainly shouldn't replace otherwise healthy behavior or give anyone a sense of confidence in their health that justifies subsequent unhealthy behavior. When you’re thirsty, yes, choose water over something with empty calories. If you’re thirsty from morning until night, figuratively or otherwise, see a doctor. Don’t let anyone who doesn’t know how much water you drink tell you to drink more water. If you’re wont to insist on chanting about defunding a national health initiative, consider this one. I know we're just trying to "keep things positive," but missing the opportunity to use this campaign's massive platform to clearly talk down soda or do something otherwise more productive is lamentable. Public health campaigns of this magnitude don't come around every day. This one squanders both money and precious celebrity Twitter endorsements. Keeping things positive and making an important point are not mutually exclusive, you fools.